Gary Yamamoto's YamaFrog is the perfect solution for buzzing over tops of grass beds and around heavy cover. 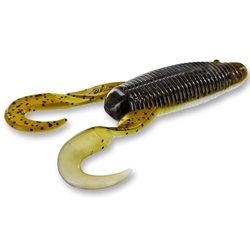 This soft body frog features a deep hook cavity in the body which ensures good hook-up ratios and will accept the largest heavy-wire EWG hooks. The YamaFrog glides easily on the surface of the water with an extreme kicking action even at the slowest speeds.